On Friday there was a very beautiful ordination Mass at St. Maria Goretti Church. We have three new priests! There are short bios of them in a news release on the diocesan website. I attended Fr. Steve Petrica’s first Mass the following morning. He is a convert who had formerly been an Anglican priest (part of this ecclesial community I believe) and in psychological practice. This was his first time validly consecrating the Eucharist, but the liturgical actions were not new to him. 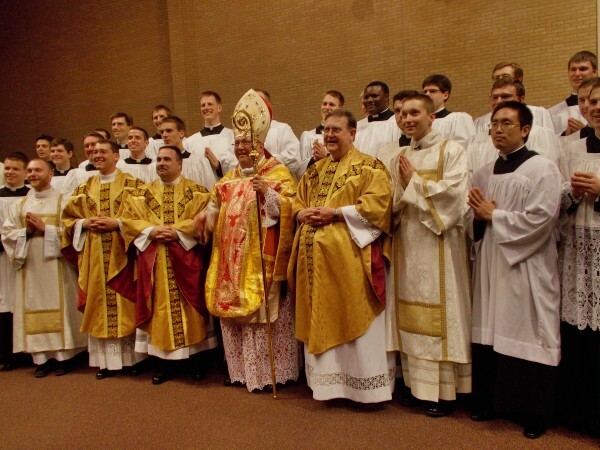 It was the Novus Ordo mostly in Latin, with Gregorian chant supplied by the more than capable Aristotle Esguerra, and a great homily,–an epic and exquisite exhortation to the new priest, by Father John Zuhlsdorf. Please pray for our new priests. Recently there was a big announcement of the diocese’s new priestly assignments. It would be fun if I was capable of doing a “Whispers In the Loggia” style commentary on it–Rocco Palmo seemingly knows everything and everyone and immediately has all the background and insight on every new episcopal appointment. But quite frankly I am not that deeply knowledgeable. I’ll miss Fr John Sasse, who I often confessed to, who will be moving from St Patrick Parish in Cottage Grove to St Clement in Lancaster. Fr Sternberg is headed to Rome to pursue a degree in liturgy at San Anselmo (some students made a we-will-miss-you-so-much video), and his place at Saint Paul’s University Catholic Center will be taken by Fr Tim Renz, a young priest who had been at St Joseph parish in Baraboo and the chaplain at the Catholic summer camp, Camp Gray. This is excellent both for Saint Paul’s and for Fr. Tim. One of my hopes for St Paul’s is simple but still unlikely to be realized, that is, for “praise&worship” Christian pop music, to which I am profoundly allergic, to be absolutely abolished, possibly excepting occasions of an entertainment or social nature, that do not occur in the church. Other than that, St Paul’s is simply a fantastic thing and doing much good, thanks to Fr Nielsen and Fr Sternberg, FOCUS, etc. If you would like to see a really excellent video introducing how much good there is at St Paul’s, click here, and to see an adorable video of a UW student who was baptized at St Paul’s, click here. Other good young priests coming into Madison include Fr John Silva who transferred into our diocese last year, now to be at Immaculate Heart of Mary in Monona, and Fr Michael Radowicz, now to be at St Bernard’s on Atwood Avenue. And Fr Randy Timmerman, the former pastor of St Paul’s, is back from Janesville to head the “social justice” parish of St Dennis on the east side of Madison, and I think that parish will be enriched by Fr Randy’s deep spirituality and love of Sacred Scripture. Meanwhile Monsignor Heiar of St Thomas Aquinas Parish on the west side of Madison will head down to Fr Randy’s former parish St John Vianney in Janesville, while St Thomas Aquinas will come under the care of Monsignor Dushack the pastor of St Bernard in Middleton, till Fr Bart Timmerman takes over as new pastor of STA in mid-July, when most of these appointments take effect. ← The Capitol Rosary Rally: it’s back, Thursday, June 20! St. Maria Goretti is where we currently go, very happy for Fr. Vince! Father Eric leaving makes me want to cry, but also very happy for him! And I hear you on the praise and worship music. We try to avoid that Mass, but I will say, the few times we’ve had to attend that one, even though I don’t like the music, they are very respectful and reverent, and we’ve managed to have a good experience anyway. And while I do agree with you on the nature of sacred music and what should be at Mass…I have to remind myself that it IS allowed so not to get too judgmental about it and distracted by it during Mass. I was excited to see that Fr. Randy is coming back to Madison! I cannot be near pop/rock music even in other settings, it’s not a matter of being judgmental, I’ve reacted viscerally against this kind of music since I was a little child, it’s not just dislike but it distresses me on a visceral level. I remember one time I wanted to go to confession at St Paul’s before that 6pm Mass and the “Mass band” was practicing, and I tried to just be tolerant of it, but the music was so disturbing that the confession went horribly wrong, I wound up very disturbed and sobbing. Just the other day I wanted to go to confession at that time on a Sunday and I opened the door and that band was playing and I just signed myself with holy water and turned around and left, it would not have been really possible to make a good confession. You would think that at least during confessions they would not allow them to play in the church. But I truly do not understand why they would let them play that music during the Holy Sacrifice of the Mass either. Apparently I am in the minority in actually experiencing it as that distressing. I’m not saying they don’t try their best with it and have reverent intentions, but as some authors (B16?) have said, it’s “dionysian” music that plays on the lower passions and makes people “feel something” which is why some people think it “helps them pray”, and it has very secular associations. The priest who popularized the “lifeteen” praisenworship Masses was accused sexual abuse, was laicized, left the Church, founded an alternative “praise&worship center” with a Sunday service based on that kind of music, and was excommunicated. My elderly friend at All Saints Assisted Living is also going to miss Fr Chad, who she knew because SMG has spiritual care of that place. I will definitely miss Fr Sternberg, who I had gone to confession to a great deal for several years. Oh, I wasn’t accusing you of being judgmental, that was all me! I think you may be in the minority with the intensity of your experiences, but I wouldn’t shed any tears if it were gone either! I agree with you that we focus too much on ‘feeling something’ to assist us with prayer. (Although I can imagine some people also use more traditional music as a crutch in that way as well). But overall I agree with you that it’s not really fitting for the sacred Mass, as opposed to music that is designed to have us focus on things not of this earth, as opposed to trying to be contemporary. I will admit, I also tend to get a bit tetchy about some of the things Alpha-O gets up to in the chapel. Not that I think they are doing bad things, just that they should not be done in the chapel because that really should be reserved for things more holy and sacred. I understand that there are space constraints but it still bugs me. I repeatedly begged for the new St Paul’s design to somehow include an auditorium space where Alpha-O could be held so the chapel could be sacred for the Blessed Sacrament and the Holy Mass, or for the really neat and beautiful auditorium upstairs at Holy Redeemer School to be restored and used for Alpha-O. In the old Mass they do not have announcements at the end of Mass, it is not allowed; if they have announcements it has to be during the homily time. I think that is better. It prevents situations like a second homily on some other topic, or someone else going up there and speaking at length, or doing a skit to announce a retreat or etc. Some priests have a better sense than others of what is appropriate. Wow. I am a member of St. Dennis and never knew it is a “social justice” parish!! LOL It is a large parish and there are all kinds of ministries and different people there. I do like Fr. Randy a lot! I hope that I will not offend anyone, but one kind of nonsensical comment is “he was validly consecrating the Eucharist for the first time” when made in reference to a priest received from the Anglican Communion? Do you truly believe that the Holy Spirit was not active in his ministry prior to his capitulation to the Roman See? When will Rome learn that you are not and never have been the center of the universe – God is! Hi, I am not offended by your being an Episcopalian. If you came to believe that the Catholic Church is the one founded by Jesus on the rock Peter which the gates of hell will not prevail against and is His Bride and Body and is the one referred to by Saint Paul when he said “the Church is the pillar and bulwark of the truth,” and if you then through prayer and study decided to come into full Communion with that Church by a public declaration at Mass that you hold everything the Catholic Church teaches and proclaims to be true to be revealed by God, and if you then sought to become a Catholic priest and were accepted by a Catholic bishop as a seminarian and persevered through studies, the bishop would then ordain you unconditionally first as a deacon and then as a priest of Jesus Christ. You would then for the very first time be able to consecrate the Eucharist as the real presence of Jesus Christ. Consecrating the Eucharist validly objectively requires first receiving Holy Orders validly. Contra protestantism, the Church is not a spiritual reality only but a body with a visible unity and hierarchical structure, and the sacraments instituted by the fully divine and fully human Christ are not purely spiritual but use concrete means adapted to impart divine grace to our humanity. There are other means by which we may receive actual grace and even sanctifying grace may sometimes be received apart from the sacraments (though one never presumes on this truth). And a person who hoped for baptism but died too soon has always been understood to receive the Baptism of desire upon death–washed from original sin and united in the Church. But during this life we do not receive the permanent character imparted by Baptism, or Confirmation, or Holy Orders except by objectively receiving these Sacraments. Christian Matrimony is also an objective reality; some putative marriages aren’t marriages in the first place, and on a certain level some of the reasons are like the reasons why certain priestly ordinations are invalid–defective form, defective intent. Like Episcopalian or protestant ministers, many people in less-than-marriages were as sincere and well intentioned as could be. But there sincerity was not about the fullness of marriage, sometimes people didn’t intend a truly indissoluble lifetime bond, sometimes they had no intention to let the union become fruitful with children. Their intent fell short of actually being an intent to marry. Catholic theology says that the bride and groom themselves are the ministers of the sacrament, they effect the marriage. In ordination it’s the bishop who confers the sacrament of Holy Orders. He has to actually be a bishop, use correct form and have correct intent. Defects both of form and intent unfortunately broke the Apostolic Succession in the Anglican/Episcopalian communion. See Apostolicae Curae. In recent times with the issue of female clerics further confusing the understanding of Holy Orders, the defects of intent have become even more pronounced and this appears irreparable. As for the Eucharist, I think there are a range of beliefs of Episcopalians, I think it is usual for Episcopalians to have a more protestant belief that does not characterize the Eucharist as sacrifice, and I am told it is rare for Episcopalians to hold a fully Catholic belief in transubstantiation, and it’s my understanding that it’s not even the norm to put remaining “consecrated” bread in a tabernacle in an Episcopal church. It is perfectly clear that Episcopalians hold different beliefs than Catholics on very fundamental matters. So, although Episcopalian clerics may insist they are the same thing as Catholic priests and that they do the same thing, there is a substantial and critical difference in how this is understood! A Catholic priest is indeed something more, and Jesus is really present in the Eucharist consecrated by a Catholic priest in a way that He is NOT present in Episcopalian holy communion, nor are most Episcopalian clerics REALLY claiming so. Well, Jesus DOES claim in the Bible that we must eat His flesh and drink His blood or we do not have life in us. He does say “this is my body” and “this is my blood” and He means it. Vatican II teaches the Eucharist is the source and summit of the Christian life–the center of the universe! It is the Lord! The Holy Spirit was at work in Fr Steve’s life all along as in all of us, and he cooperated with the leading of grace to come home to the Catholic Church and seek ordination as a priest, the fullness of the ministerial priesthood offered by the Church Jesus founded. But even that is not greater than being in the unity of the Church and receiving the Eucharist in the state of grace.